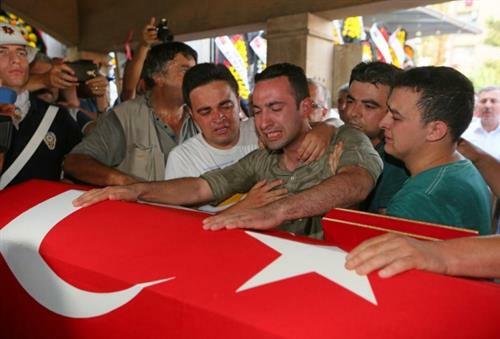 At least 23 Turkish security personnel have been killed across Turkey in suspected Kurdistan Workers Party (PKK) attacks since July 7, according to data compiled by Anadolu Agency. According to the data, at least 11 civilians, including an Iranian national were also killed in such attacks, while 101 people, including three Iranians were injured during the same period between July 7 and August 7. The data does not include casualties from the recent suspected Daesh bombing in eastern Suruc town that left at least 32 civilians dead. During this period, more than 100 vehicles were also allegedly set ablaze by PKK. Meanwhile, Turkish Armed Forces have continued to target PKK's position in and outside the country. In operations conducted until August 1, more than 260 suspected PKK militants, including alleged senior members were killed and over 400 other suspects were detained. Also, Turkish police have launched nationwide operations against other outlawed organizations, including PKK, Daesh and the far-left Revolutionary People's Liberation Party-Front (DHKP-C) as well as the Patriotic Revolutionist Youth Movement (YDG-H) linked to the PKK. Since July 24, around 1,600 suspects were detained and of those, 314 were put behind bars. Turkish prisons have a total of 6,121 convicts and inmates accused of being members of terrorist organizations. There are 3,788 convicts and 783 prisoners from the PKK, whereas 195 convicts and 58 prisoners from the KCK. Of those, the prisons have 213 convicts and 58 prisoners from the DHKP-C.
On Thursday night, some suspected PKK members were killed when an explosive they were trying to plant on the eastern Hakkari-Cukurca Highway exploded prematurely. In southeastern province of Mardin, suspected PKK supporters attacked police; however, there was no casualty in the incident. A suspected PKK member surrendered to security forces in southeastern Sirnak province; a group of PKK members also harassed the district governorate, security department and gendarme building in Sirnak's Uludere district. In Cizre district of Sirnak, police officers came under rocket-propelled grenade attack from suspected PKK members; two policemen were injured. In another incident, three people were killed, including two policemen and five people were wounded in an attack in Sirnak's Silopi district. In eastern Agri province, five trucks were set ablaze in Dogubeyazit district where clashes broke out between security forces and suspected PKK members. Agri governorate said that one soldier was killed in the clash and one Iranian citizen was also killed. Three Iranian nationals were also injured. Also, police officers detained seven people in an operation against the YDG-H group in southeastern Batman province; three others were also held in the capital Ankara. Suspected PKK members also planted a mine in eastern province of Mus, which exploded when the Tatvan-Elazig train was passing by. Three wagons were damaged in the attack. Seven people were also detained in southeastern Diyarbakir province when pro-PKK and KCK supporters blocked traffic and held a demonstration. PKK has recently intensified attacks in Turkey, which according to Turkish security forces was an attempt to thwart people's right to travel and sabotage investments in eastern and southeastern Anatolian regions. The attacks escalated after the PKK-affiliated the Kurdish Communities Union (KCK) reportedly issued a statement to target vehicles used for dams and dam construction last month. The PKK was targeting Turkeys investments, economic incentives and reforms in health, education, tourism, agriculture and livestock sectors that were launched during the government's "solution process", Turkish security sources say. The Turkish government launched the "solution process" with the PKK -- which is listed as a terrorist organization by Turkey, the U.S. and the EU -- in 2013 to end the conflict which has claimed 40,000 lives.